Bicycle Accident Lawyer Kevin Cortright has been protecting the rights of injured bicyclists for over 15 years. He knows the challenges facing cyclists who have been hurt while riding a bike in California. 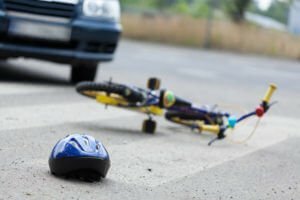 Whether your injuries happened while sharing the roadway with trucks and cars, or your injury was due to a defective bike part, Bicycle Accident Attorney Kevin Cortright can help you navigate the legal system while pursuing the maximum compensation allowed by law Call (951) 677-8064 or (760) 325-6900 to discuss your situation today. Bicyclists are far more vulnerable on the road than auto drivers, and it seems like bicyclists ought to have some special consideration under the law. California’s vehicle code actually says that bicycles have the same rights and responsibilities as cars, trucks, motorcycles, and all of those other, much larger vehicles that share the road with bikes. According to the National Highway Transportation Safety Administration, California has the highest number of bicycle accident fatalities in the nation, and the number of fatalities has risen each year since 2010. In light of these statistics, the state has added more laws intended to protect bicyclists. However, the fact remains that a bicycle is a small, human-powered vehicle sharing road space with much larger and more powerful vehicles, and regardless of whose fault an accident between a bicycle and a motor vehicle may be, the bicyclist is the one most likely to suffer serious injuries. If you’ve been involved in an accident where your bicycle and a motor vehicle collided, it’s important that you consult a knowledgeable bicycle accident attorney as soon as possible, and definitely before you speak to the other party’s insurance adjustor. Write down anything and everything you can remember about the accident: Traffic, weather, and road conditions, approximate speeds, directions, and any other relevant details. Also, make note of and report any injuries, even if they seem small, or you don’t notice them for a day or two after the accident. In some cases, injuries worsen over time, and in other cases, an accident victim may be too stressed to notice an injury at the scene. Even if you don’t require emergency treatment after an accident and you think you’re fine, you should be seen by your physician or at a clinic as soon after as possible, especially if your head got bumped or hit the ground. Do I Really Need a Bicycle Accident Lawyer? The answer is a loud, clear “YES!” and there are a couple of very good reasons. First of all, in bicycle accidents, like in car accidents, liability is determined by learning which party was not following the rules of the road and caused the accident. Unlike auto accidents, though, where one driver is most often found to be at fault, in cases of bicycle accidents, liability is more likely to be split. That could mean that each party would be responsible for their own damages, or worse, if you’re assigned a majority share of the liability, you could owe the other party for their damages. An experienced bicycle accident attorney can help gather evidence and present an effective legal argument against shared liability. The other primary reason for you to hire an experienced bicycle accident lawyer after a bike crash is to keep the insurance companies in line for you. They work very hard to prevent you from hiring an attorney in the first place. Their first approach to you will likely involve them making warm, sympathetic conversation and possibly even admitting their client’s liability. They assure you that they’ll take care of everything and have you back on your wheels in no time. No need to hire an attorney, right, friend? Once they feel confident that you’re not going to hire an attorney, though, those same super-friendly adjustors won’t have time to take your calls. They will make excuses not to pay for this or that. They’ll drag their heels, and hope you’ll eventually settle for a ridiculously small settlement, just because you’re sick of dealing with them and want the whole thing to be over. Depending upon your specific case, you may be entitled to compensation for expenses such as medical bills and property damage, along with lost wages. If the other party is found negligent, you may also be entitled to additional compensation for emotional suffering, physical pain, and loss of quality of life. If your injuries cause permanent or long-term damage, you may also be entitled to payments for future medical bills and care, and loss of your future income. It’s a complicated matter that arises from a stressful and painful situation. You are already dealing with enough pain and aggravation. Contact the Law Offices of Kevin Cortright for a free consultation and we’ll let you know your rights and options for a bicycle accident personal injury claim. If you’ve got a case, we’ll review and investigate every aspect of your accident and condition to make sure you get all the compensation available. Call (951) 677-8064 or (760) 325-6900 to arrange a private, complimentary consultation with Bicycle Accident Attorney Kevin Cortright.